The advantages of the HP LaserJet 1012 laser printer will revolutionize the way you complete printing projects in any office environment. 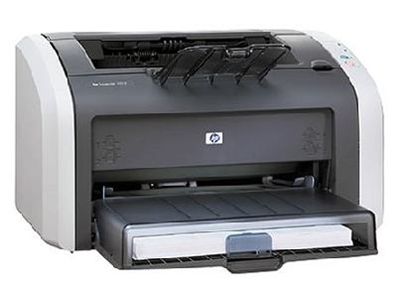 Discover the advantages of personal HP LaserJet printing in any office environment. The HP LaserJet 1012 printer offers desktop laser printing for small businesses, home offices, and single users in corporate environments. The sleek, compact design fits seamlessly into your working environment without requiring you to reorganize your workspace. Media Sizes: 3" x 5" to 8.5" x 14"
(H X W X D) Unit 8.2" x 14.6" x 9.1"